Valentine’s Day is coming soon. For some, Valentine’s Day can be that one holiday out of the year that can either trigger every romantic bone in your body, or cause you to cringe out of annoyance — or maybe even hopelessness. No matter how you feel about Valentine’s Day, you can still treat it as a day when you do at least one special thing for one important person in your life. So why not give them a beautiful bouquet of fresh flowers? Conveniently enough, you can buy them on campus during a floral sale in the American River College Student Center on Feb. 14, and support the college’s Horticulture Program. 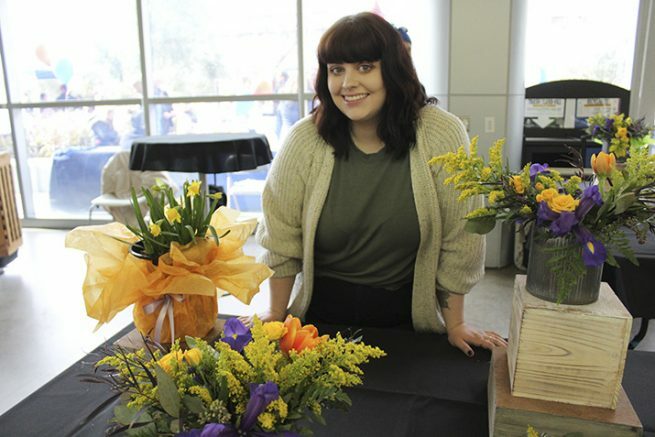 For some, flowers have long been considered a cliche Valentine’s Day gift, but not according to Christen Hollingsworth, a student intern in horticulture at ARC. According to Hollingsworth, flowers are such a traditional gift that you can’t go wrong. You could go with more traditional flowers in your arrangement such as roses and peonies, she said, and if you’re feeling more adventurous or your recipient appreciates going outside the box, you could go for softer, lighter, earthy tones like peaches and browns. Currently the Horticulture Department is getting its flowers from a wholesaler, but Hollingsworth is working with other horticulture students to start growing flowers on campus. Hollingsworth says they are working hard to get flowers into the ground and towards the end of the semester they will have their own small flower farm on campus. Hollingsworth said she hopes everyone will consider buying their Valentine’s Day flowers at ARC because it is a much more affordable option as opposed to going to other florists. If you’re looking for a meaningful gift to give someone on Valentine’s Day to show you care, consider stopping by the horticulture floral sale on Feb. 14. They will continue with their floral sales once a week every Thursday. There will be a variety of different, beautiful flowers and greens that are sure to make your recipient feel happy and loved. Ariel Caspar is a first semester staff writer for the Current. Caspar is a journalism major and plans to further her education at a U.C. to attain a bachelor’s degree in journalism. Be the first to comment on "Horticulture gives the gift of flowers"